All of these changes are still subject to change. Yes, the RT has approved it, but it still has multiple steps to pass through. First, it must go through playtesting, and if anything is flagged as broken, or overpowered, or underpowered, we will go back in and fix it. The end result should be a book that is playable, and expands the options currently available. Additionally! There are no points yet, points won't be truly final until after all the books have been tested and the balance team can assess the game as a whole. So everything we propose to you will be without points. We know that pricing makes and breaks units. We need to trust the BLT to do their job, they will have internal testing to help provide feedback, and then 2.0 beta for you guys to provide feedback as well. Hello all. I'm happy to announce that we'll start providing some info from the new book soon. Before more detailed information here's a small teaser for you guys. WDG Giant, huge spear or twin axes! Your choice! A tear in the veil has opened, behold, The Exalted Heralds! The monstrous Karkadan ride forth to battle! The Feldraks storm out of the Wasteland! A chill wind blows from the Wasteland! What are the Dark Gods' favored colors? Cast your vote and get ready to paint! Updat to community concerns regarding Feldrak Ancestor! Here lies the colors preferred by the Dark Gods and their followers! The Chosen Lord of the Seven reveals himself! The post was edited 19 times, last by tunasandwichify ( Dec 17th 2017, 7:58pm ). Additionally! There are no points yet, points won't be truly final until after all the books have been tested and the balance team can assess the game as a whole. So everything we propose to you will be without points. We know that pricing makes and breaks units. We need to trust the BLT to do their job, they will have internal testing to help provide feedback, and then then 2.0 beta for you guys to provide feedback as well. By now you've all seen the pictures and made guesses as to what a Giant is doing standing in the middle of a unit of Barbarians with a huge spear. Well if you guessed that a giant roaming the wastes with a horde of Barbarians would end up mimicking his little buddies, well then you guessed right! The new giant rules have allowed each army a set of unique weapon options! For Warriors of the Dark Gods, our Giant see, Giant do is all about Barbarians! He'll either be marching into battle, keeping an eye on his tiny battle buddies wielding a giant spear, stunting any enemy charges that threaten their unit and also help take down those pesky monsters our Barbarians hunt in the wastes. Or he'll be wading into battle alone, wielding dual axes, cutting swaths of enemy infantry to ribbons! Greetings fellow Warriors of the Dark Gods!!! Today we bring forth the most devoted and loved children of the Dark Gods - The Exalted Herald! Ascended by their masters, these inhumanly fast and immensely powerful beings channel manifestations granted by the Gods that give them abilities unmatched by the mortal followers they accompany. Touched by the veil, these twisted embodiment's of terror stalk their prey, threatening large swathes of the battlefield with certain destruction. Let's talk about the current Demon Prince. Here is a unit that is fluffy and cool as all hell, but rarely used due to cost and vulnerability to shooting attacks. Balancing the inherent potential of such a beast often led to vulnerabilities that overrode it's usefulness in many matchups. Investing a thousand+ points in a all in one package only to risk being one shotted off the board with no recourse of defense caused many players to shy away from what should have been an exceedingly fun choice. How can such a potent force be balanced, avoiding the "hide behind the hill but dominate games without cannons" meta? Obviously, removing combat potency is a no go - these heralds are hand picked by their Gods to tear into the mortal realm. Maintaining a strong combat presence has to remain. While not necessarily the most impossible of duelists to overcome, no hero should be especially excited to come to grips with this foe (unless a heroic epic or martyrdom be the goal). More importantly to the design here is a degree of customizability for the model to provide the most possibilities for you, the community, to create personalized avatars to lead your forces. Obviously, when such care and time investment is expected, the design team wanted to ensure that what ever you end up putting together flows into a multitude of army design paths, so let's talk about the real kicker here- the manifestations. Each Exalted Herald is given the option to select 2 of 5 manifestations AT THE START OF THE GAME that give both potent physical abilities and dictate what spells the model has access to. This gives a ton of options to create a Herald that caters to your playstyle and opponent, while making sure Heralds still behave within certain understood parameters. As an example, let's take one potential aspect- the "Brand of the Dragon". This selection gives the Herald the ability to fly and access to the Thaumaturgy spell Cleansing Fire, mimicking draconic attributes. Here is a highly versatile choice that will supplement a mobility based army that could otherwise be bogged down by redirectors by flying over or "cleansing" said interceding units. This is also one that savvy players will select depending on what the table terrain is looking like (wouldn't want to constantly be hopping into and out of forests with a flyer) and should there be a predominant theme of anti-flyer capabilities across the table, probably best to look elsewhere for a less risky manifestation. You know what, let's go ahead and give a taste of one more while we're at it. The "Unholy Avatar" gives access to a halberd and grants Terror to the model, while also allowing the Herald to cast Awaken the Beast. Here, the possibilities for a much stronger combat character arise, one able to buff itself (or others) in combat and rely on the Shamanism attribute to further it's resilience. Anyone who has tried to take out a ward save toting baddie while they are under the effects of a 5+ min to wound knows that it's no small feat. Note he is no longer Gigantic, nor does he count towards Legendary Beasts category! So what do we think fellow worshippers of the not so savory? Here's a call out to post some pics of what maniacal, malformed, or mystical deviant may be leading your forces across the mortal plane shortly. The post was edited 1 time, last by tunasandwichify ( Nov 10th 2017, 3:29pm ). Lords of the Seven! We bring you news from the wastes! Several of our sorcerers have returned from convening with demonic entities beyond the veil. They speak of the flux and how it has weakened, making it harder for the Dark Gods to gift us with more than their blessings. They tell us our gifted demonic mounts are too much of a burden for the demons to push through. Fear not! I hear your cries of blasphemy! But we are Warriors of the Dark Gods! We need only prove ourselves and the Gods will gift us with any tools we need to crush the non-believers! We need not the fickleness of demons! It will also please you to know, the first Sorcerer to bring this to our attention now adorns the banners leading into camp. The remaining Sorcerers were spared by the timely arrival of some of our beast tamers. For they brought forth a new beast, we broke them, and now the monstrous forms of the Karkadan will be carrying the Lords of the Seven into combat! While the Karkadan are larger than the steeds our Knights ride, they will allow us better flexibility when riding to battle with our Chosen retinues! Demons be damned! Our faith shall not be shaken! We shall show the Seven why they chose us in the first place!! Demonic mount and Crusher character mounts have been merged and will now be one monstrous cavalry mount on 50x75 base. Standby for a big spoiler tomorrow and plan for weekly spoilers every Friday from now on! I’d like to put aside the base issue for a moment and talk about the general theme of what this army represents in the 9th age, and why perpetual accommodation is difficult. The WDG book represents the first foray into truly redesigning a faction within the 9th age world that is both unique and, for lack of a better term, nostalgic. In this design process a number of ideas and thoughts were garnered from the community and considered- current units/models people had, attachments to certain playstyles, crowd sourcing item concepts- and ultimately had to be culled and reworked within the design parameters of the concept going forward as opposed to looking back. Some of the current choices are being made as a way to coincide with general overarching simplification goals, and, to the point made above, open up standards for other model companies to coalesce around. What does this mean for WDG, and you? Well, it’s been difficult to reveal as much as other books as there are still debates ongoing about units composition, stats, rules, and general thematic placement within the whole that other books haven’t had to deal with. The goal is to produce a book that is fun, balanced to the new system, and ultimately introduces a multitude of in depth army composition concepts. Let’s delve into those, and maybe the base sizing will make more sense. In the Warriors book, you’ll find several distinct facets to the army, and each segment follows a progression through where they are in their relation to their dark bestowers of power. However, before talking about those, the book has gotten it's own, unique armour. This is not an ordinary armour at all, it is the first step on the Path of the Favoured, one of the things granted to you when trading in your Soul, your right to get reborn, for your ultimate freedom and the possibility to ascend beyond simple rebirth. Follows the rules for Plate Armour (can be enchanted as if it was a Plate Armour). The wearer gains Fearless. If more than half of a unit’s models have Hell-Forged Armour, the unit must reroll failed Break Tests. There is the FAVORED faction, those hell forged warriors of resolute and implacable armor, who as they arise and become chosen by their particular gods, unlock otherworldly power, becoming amongst the most terrifying single combatants in the entirety of the realm. Models with this Universal Rule can make one more Supporting Attack than normal from the second rank. Units with one or more models with Path of the Favoured cannot add Rank Bonus to their Combat Score. A model with Path of the Favoured that fights in a Duel gains +1 Discipline until the end of the Melee Phase. As you can see, you are no longer forced to challenge with your Character models (this rule is completely gone), however, there is an incentive to do so. While the bonus looks rather smallish, all models with Path of the Favoured have this exact special rules, even unit Champions! Next are the EXILED, those who have fallen from direct favor of the gods yet serve them still. Oft barely still considered men at all, these madmen become abominations in the eyes of many, yet due to the devoted madness within themselves are afraid of nothing, standing strong in overwhelming odds where even the mightiest warriors would have fled. Monsters and madmen alike, their bodies warp as do their minds. The model gains Stubborn in the first Round of Combat provided its unit does not have more ranks than files and is Engaged in Combat in its Front facing with an enemy unit. Units with Path of the Exiled cannot join or be joined by units without Path of the Exiled. However, if an EXILED one fails the gods even more, something more horrible than death awaits him. He is stripped of his free will, loses everything he has ever strived for and becomes IRREDEEMABLE. Sometimes even a Warrior on the Path of the Favoured could betray his God in such an irredeemable way, that he falls directly to this state, a state of no return. The model gains Unstable, cannot use Stomp Attacks, and can use Grind Attacks as Supporting Attacks (ignoring the maximum number of Supporting Attacks). When a model with Irredeemable is killed by a Melee Attack, remove it as a casualty only at Initiative Step 0. A unit with at least one model with Irredeemable may never have more ranks than files. Fourthly, there are the BARBARIANS, mortal followers of the gods who revel in what the gods represent. These followers fulfil a number of different roles in the army, from infantry to light cavalry raiding units to taming fantastic beasts to bring to the battlefield. To represent their fast paced way of living and war, they got a fitting special rule representing this exact trait of them. Units consisting entirely of models with Battle Fever must reroll any natural rolls of ‘1’ when rolling for Charge Range. Finally, the FELDRAKS. These dragon kin represent the pinnacle of monstrous might, growing larger and more terrifying over the ages until they reach a truly monumental scale. Within these aspects to the faction are multiple entries that are meant to highlight different things each excel in, and so provide a multitude of gameplay choices while adhering to the army design constraints an individual faction should have and embody. Within the team, we are still polishing several entries as we try to ensure the viability of gameplay of the individual unit likewise correlates to the thematic purpose of the unit, hopefully culminating in a book that feels like it has a “brand new history” to it. Returning to the base sizes, please take into account this project is more than just a “bring your stuff to the table and play” like AoS tried to create (and many of us shunned), and instead is an effort to create a fully coherent ruleset and world to support the greatest number of players possible within the confines of an internally simplistic core set of guiding principles. On a personal note, I play an army that is more greenstuff than plastic or metal, having spent a great deal of time over the last couple of years creating a very individualized army that has no connection whatsoever to the 9th age theme and world. I do approach the game from more of a tournament player aspect myself, but I will say I’m probably in the minority on the ACS team you have, the others of whom are very concerned with the lore and “feel” of the army remaining both true to the past while also embodying the new world ahead. They too expressed concerns with sizing, but ultimately came to understand the broader scope of the change and are trying to explain it within the scope of that change, If that makes sense. Trust us when we say, we appreciate that there will be some things that aren’t necessarily accepted as necessary by all, however within the greater context of a cohesive game, we hope will become apparent as good changes in the end. The Feldrak Ancestor and his kin! Below you will find the Feldrak family progression! Starting from right to left, you have the Feldraks, the youngest in the family. 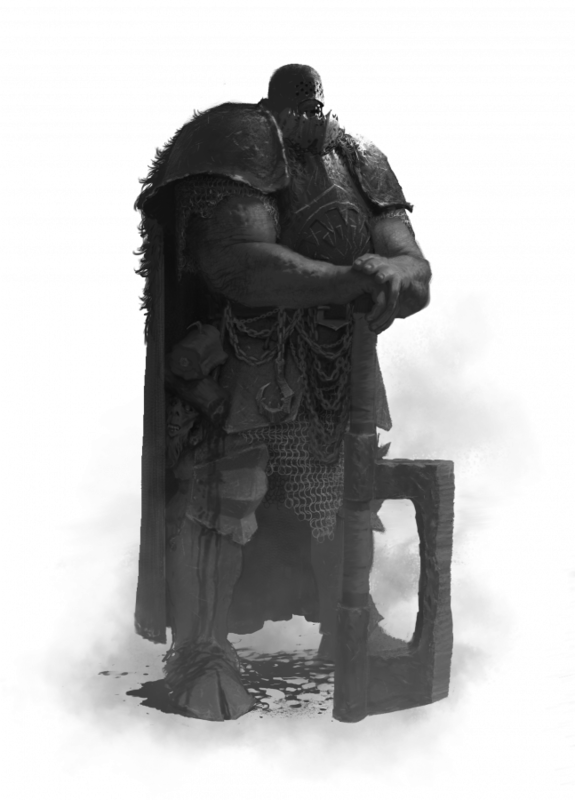 Next is the Feldrak Elder, hardened from centuries of battle and grown to monumental size, they dwarf their younger siblings...but they do not compare to the massive size of the big daddy of them all, the Feldrak Ancestor. As it's name implies, these bad boys have lived for countless centuries and taken part in unfathomable battles. Surviving and ascending to the top of the food chain with in the wasteland. "Feldrak." This ominous sounding name has spread from the borders of the Wasteland throughout the world. Its precise meaning and origins are not certain, though some draconic connection has long been speculated. What is known is that the creatures so named have long associated themselves with the Warriors and their Dark Gods. Some claim them to be no better than beasts, acting out animalistic impulses. Yet those who have experience with the Warriors have seen them act with ferocious savagery, yet also with independent discipline. Warriors who interact with them do so as comrades in arms, not masters of beasts. What is known about them, beyond their prowess with the huge weapons they carry, is their fury towards creatures that can fly. Whatever the reasons, this enmity has become legendary. When Marshall Schulhof fell at the gates of Zuidstal, it was a pack of Feldrak who tore him from the back of his griffon and dismembered the unfortunate beast. Stories of the defeat of High Prince Enbalar tell of the elf's dragon being cut down by one of the Elder of their kind. Now, reports have spread of an even greater Feldrak being seen beyond the Wasteland and other areas of high magic. These creatures rival dragons in scale, and have been seen leading entire armies populated with all manner of beasts, both Feldraks and other creatures, never seen in such numbers. Whatever these being are, they strike dread into the hearts of those who encounter them. No doubt we will learn more of them in times to come. Below you will find the current statlines of the Feldraks! Points have been omitted as those can change. But the statlines should remain the same. Not much has changed for our Feldraks. We gained an inch of movement, +1Agi(formerly initiative), gained fear(as it should be!) but lost Mark of True Chaos, but then gained Hatred vs Flyers!! To hell with you Highborn Elves and your flying circus! Next up we have the Feldrak Elder! Again, gained an inch of movement, went down in WS/Agi by 1. Gained Hatred vs Fliers. Lost Mark of True Chaos, as Feldraks do not actually follow the Dark Gods. They make their own way! They are also not mindless beasts and so no longer immune to psychology. They didn't get so old and big by taking a charge from impossible odds after all! And of course a bump in his base size to help show the progression from Feldrak to Feldrak Elder. You'll also notice his stats mirror that of a standard Dragon, only instead of fly, he has weapon options! This behemoth is the closest to their dragon ancestors without getting your eyes burnt. (name that reference ) Displayed by their "Dying Embers" Special rule. They have a Str4 AP1 breath weapon, an ability they retained from their former lives. Though the mutation from Dragon to Feldrak took millennia, the Ancestors still have a fire burning in their souls and can unleash its fury, at a cost. You'll also notice that his stats mirror that of an Ancient Dragon, and like the Feldrak Elder, he loses the option to fly, but gains weapon options! Due to their fleeting memories of their former glory, the loss of their ability to fly has left them with a hatred for those who can. If he is your general, he bumps the Legendary Beasts category up to 45%!! But removes the ability for models with Fly. At Str7 he's a beast! Add in a Halberd or a GW(!!) He becomes Str8/9 respectively!! Take that T8 monsters!! A chill wind blows from the Wasteland, seeming to carry with it the chittering of daemons. The sky darkens, and a sinister figure emerges from the shadows. "Greeting Warriors, I come from lands you cannot imagine, where the teaching of demons has made me powerful beyond mortal dreams. Unlike those lesser mages, whose bodies cannot handle the raw energy of the veil, I embrace it! I can open the flood gates and use Immortal power to boost my most devastating spells! All while withstanding the torrent myself!" The following units will have The Reckoning: Exalted Herald, Sorcerer, and Battleshrine. "We could see him from across the field, an unworldly aura coalescing around him. The very fabric of the world seemed to flee from his advance. Then, with a sudden gesture of his clawed hands, the air around us started to crack and split. What vomited forth from that unholy place melted men and armor alike. I could hear his mad cackles spewing out from the tear in the veil…it haunts my dreams." The Hereditary spell can be swapped out during spell generation. Also note, Strength and AP are no longer linked. So, for example, Strength 4 is not AP1. So if you spend 3 Soul tokens on Hellfire, your spell will be S5, but remain AP2. We also have a change to our Sorcerer's path choices. Some of you may be disappointed, others will love the change, but overall we felt like this is exactly what our army needed! It was discussed that, background-wise, Evocation fit WDG, while Shamanism was less fitting. Shamanism is a good path, but evocation will help the army in the much needed buffing/synergy department. For example, with Evocation, we now have access to buff spells such as re-roll to hit and to wound. Something I'm sure all of us would love on our high stat warriors! Also of note for Evocation...those pesky unit champs keep challenging out your big bad character-killer Lord? Snipe him out of the unit with Evocation and send your character in to waylay his comrades or challenge out his squishy character! Note: Shamanism is gone from the sorcerer, but spells from the path still manifest within the army. In the form of the already spoiled Exalted Herald! Some fun as well as a background spoiler for you all! Due to concerns from the community, both regarding a monstrous ancient being caring about puny mortals fleeing, and the lack of customization in a character entry, we have taken your concerns to the TT who came up with the below rules, which were accepted by RT! So now you have the ability to buy a magic weapon for your Feldrak Ancestor! Double points due to how big the weapon has to be to be of use to him Also, the Feldrak Ancestor's statline is already pretty brutal and giving him some of the magic item options is pretty silly...allowing a wardsave/regen save (and many other items) on a model with T6 and 8 HP would be a tad over the top and most likely not fun to play against. Rejoice Followers of the Dark Gods (and their paint schemes!) the following are the preferred colors of the seven! The Fallen Star draws others with his same self destructive impulses. Those who have fallen from exalted stations and consider their abilities to set them above others, yet cannot hold power in their native communities, find natural homes with the Morning Star. Clothing themselves in regal blues and purples, they adorn themselves with crowns, stars and heraldry, seeking to claim titles for themselves they were denied in their past lives. The fly on the wall, the Schemer, Kuulima sees the power of others and desired it for herself. She is bolstered by the envy of Mortals and their plots and jealousies. Some of her followers believe her to be the great leveller, who will set all peoples on level ground. The less noble minded of her worshippers simply desire what others have and seek the strength to take it. While many take on Kuulima's icon of the fly and the green associated with her, they largely surround themselves with stolen heraldry, armours and weapons. Vanadra's eternal fury is fuelled by betrayals and injustices, and the drive to seek out and punish those traitors. So did Wrath and her followers become the vanguard of Father Chaos' forces, and also those who strive against perceived injustice and betrayers of the Dark Gods' principles of freedom. With cruel armour the red of blood, and black gauntlets as though coated in viscera, they strike fear into the hearts of the Dark Gods' enemies. The Watcher, Nukuja sees all things. She knows the end approaches, knows the death of all Mortal life. Her followers believe she will observe the end of things. Taking their cues from her, they have a timeless appearance, ancient armour and weapons put to good use in her service. Under the sign of the locust their dirty white cloaks cover rusted metals, but they are no less dangerous for that decay. Unlike other Dark Gods, Sugulag collects more than simply power though, lost items of all nature find their way to his followers and into their grasping hands. Misers and thieves find a home with the Collector, embellished with brass, chain formed of interconnected coins, and golden faced demonic helms, always turning towards the possessions of others. Cursed with gross and disfiguring afflictions, the followers of Akaan devour all beauty before him. Gluttons everywhere sought his blessing, and received his accursed appearance, leaving their jaws exposed even in combat, the fear of being consumed filling all those who encounter the Devourer's disciples. Browns and rotten greens form their colourings, all beneath the sign of the Lamprey, representing their eternal hunger. Cibaresh is fabled for tying with mortals, throwing temptations in their path in the hope of subverting their religious instructions. To him are drawn the deviants and the debauched, often drawn from those with the strictest of upbringings. The lips and tongue of seduction decorate their attire and standards, vibrant violet and blues leaving no doubt of their intentions, while their disconcerting and often beautiful masks conceal the sadistic and lecherous individuals beneath. Attacks made with this Weapon have their Armour Penetration set to 10 and gain Magical Attacks, Flaming Attacks and Multiple Wounds (D3). Oldie but a goody. Boasts no armor save for the enemy, magic and flaming attacks and is rounded off with D3 wounds. Character killer. Mount this guy in a Knight bus or atop a mighty mount and let the killing begin! When using this weapon, the wielder gains +2 Attack Value and +2 Agility and suffers -2 Offensive Skill and -2 Defensive Skill. Attacks made with this Weapon have gain Magical Attacks. Spines of Spite - Standard Size models only. The wearer gains +3 Armour and Cannot be Stomped. Armor save is getting a facelift for 2.0. Roll a D6 and add to the score the mode's armour modifiers, and then reduce score with attacks armour penetration. If the results is 7 or more, the save is passed.(Math!) Plate Armour gives +3 armour, so it just means the model has a 1+ save. Standard being what used to be called infantry and cavalry (although not terribly useful for mounted models). Basic idea was to help make foot lords viable with a 1+AS and can't be stomped! Pretty solid! The bearer gains +1 Attack Value while using this Shield. The bearer can cast Cleansing Fire from Thaumaturgy as a Bound Spell with Power Level (4/8). If you hadn't figured it out, with the flow of the paths of the Favored and the Exiled, only certain units will have access to Favors(old marks). So unfortunately, no more Once Chosen Conclaves. BUT, you can still have semi-conclaves via this new banner enchant! Which you can have two of in the army! Who doesn't want to give a model a breath weapon while in a combat to help rack up CR? All models in the bearer’s unit with the same Type and Size as the bearer gain +3” March Rate, to a maximum of 20”. Pseudo-banner of speed, meant to allow our infantry units to move up the field and get into charge range asap! The bearer's unit gains Strider (Ruins). After Determining Deployment Zones (at the end of step 6 of the The Pre-Game Sequence), you may choose a single Forest, Field or Building Terrain Feature. A chosen Forest or Field become Ruins, a chosen Building becomes a Cliff. Oh hey, doesn't this look familiar? <cough>community inspired<cough> Give this to some Chosen Knights or Knights and they laugh at your piddly forest/field! The bearer gains The Reckoning. All friendly units within 8” of the bearer are considered to have Hell-Forged Armour for the purpose of The Reckoning. At the start if the Deployment Phase, you may choose one of the opponent’s non-Character units. This unit loses Vanguard, Scout, and Ambush. The opponent must immediately deploy this unit (this is done outside the normal Deployment procedure). Wanna know where your opponents Deathstar is going to be placed? Make him put it down first and deploy around that! Who says we don't have some deployment shenanigans! At the start of any Phase, you may discard a Soul Token from your Soul Token pool. If so, choose either Divine Attacks, Flaming Attacks, or Magical Attacks. The bearer’s Close Combat Attacks and all non-Bound Spells with the Type Damage cast by the bearer gain the chosen Attack Attribute. The effects last until the end of the phase. Mark of Change in a can! Units with Irredeemable within 12" of the bearer may reroll the distance they move in the Movement Phase with Random Movement. Two unit entries representing Irredeemable units in our book have random movement. A good way to zone out chaff who tend to like to run away if charged. This item helps mitigate that randomness a bit to get our irredeemable buddies in to munch some goody goody chaff. One use only. Must be activated when the bearer is hit by an attack with Strength 5 or higher or Armour Penetration 5 or higher. The bearer gains Aegis (4+) until the end of the Player Turn. Wanna use that bad a$$ Manticore/Disc rider model you spent a pretty penny on without having to buy an expensive ward save? Throw this bad boy on him and make your way across the field with more confidence! Cannons be damned! Hail to you, great warriors, sorcerers and beings all in service to the dark powers. Tonight we bring you once again a glimpse into the future, a small peek behind the curtain of time. Yes, it is once again time for more spoilers of the upcoming 2.0 Daemon Legions book, however this one is different, for this time we bring something for our mortal comrades as well. Today’s spoiler will be heavily relevant for both the WotDG and the DLin the 2.0. Right before the battle (during step 7 of the Deployment Phase Sequence), if you have one or more models with Favour of Kuulima, choose 2 units from the opponent's Army List. If playing Warbands choose 1 unit instead. If playing Grand Armies choose 3 units instead. Attacks from model parts with Favour of Kuulima must reroll failed to-hit rolls with attacks allocated towards models in a chosen unit and against Characters in the same unit as a chosen model. Attacks from model parts with this Favour must reroll failed to-wound rolls. This can only be used if the model was Engaged in Combat in the previous Melee Phase. The attack gains Battle Focus (against Scoring). Units that lose a combat while in base contact with a non-Charging opposing model with Favour of Sugulag lose Scoring until the start of the next Player Turn. Models with this Favour gains Strider. Enemy units suffer -1 Offensive Skill for each opposing unit in base contact with it that has at least one model with this Favour. If a unit has at least one model with Favour of Savar, when taking Discipline Tests, roll one additional D6 and remove the highest D6 rolled. Attacks against models with Favour of Nukuja suffer -1 to wound. If a model with Favour of Nukuja Declares a Charge or performs a March Move, this effect is lost until the start of its owner's next Player Turn. Attacks from model parts with this Favour gains +1 Offensive Skill in the first Round of Combat. Units with a majority of their models with this Favour must reroll failed Charge Range rolls. We bring an old entrance with some new flavor. We took him apart and put him back together again, dressed in a fine new 2.0'ish armor. We bring you: the Chosen Lord. Since WDG book is the last to be release we wanted you to have some fun with thinking about builds that will be possible when BRB is released. He is intended to be among the most deadly fighters our there, and the best mortal fighter. We did some big changes on him which will change the nature of how Lord is used, changes are made to complement Path of the Favored rules. Due to AWSRs, Favors, Gifts, extensive Mount options and Artefacts he is the most complex entry in the book, by far. Maybe even in the whole T9A game. You can make many builds, but all of them still have the same old weakness: a lot of points for a specialized unit -> this is where Exalted Herald is the opposite since you can cater to each opponent. One of RT complains was that 2xLord was too common and strong so first way of fixing that is for only General to have access to 200 points magic items. On the other hand heaving a split entry for Harbinger wasn't really needed so BSB can take up to 150 Magic items. This is because Path of the Favored offers Break rerolls by default so BSB doesn't give the model and Follower army that much benefit. BSB with 150 Magic items is very strong due to heaving access to Banner Enchantment on the model and Gifts, some nice combinations can be made. Especially Master of Destruction and Luck of the Dark Gods are main Gifts for out of the box combinations. We experimented with complex Gifts but the model was too cumbersome to play then. The only old complex Gift that is left is Entropic aura which is meant to counter enemies with strong multiple wounds weapons. Discipline was downgraded to 8 to have army consistency and was one of the main things that allowed us removal of Harbinger as an option. You can still have 9 with issuing a Challenge. Another thing is that AWSR gives Fearless so Lord does not suffer -1 Discipline from Fear causing enemies. Overall tests show Ld 8 is not a problem, it gives flavor and changes building process and how you play the army compared to other armies in T9A. Remember, he is a fighter first, leader second. Speaking of fighter, Weapon skill to-hit table was changed a bit and with that Lord lost a point in Def. We wanted WS4 Elite Infantry to keep hitting him on 4+, on the other hand he is hitting them back on 2+. And don't forget that Parry now works with magical items, so Def 8 is available if you go on-foot with him, a choice that was also made more attractive with increasing his base Movement to 5. Anyway, we hope that the new Chosen Lord shows how we wanted to change the army with keeping the good stuff (builds options) and removing the unneeded legacy (split profile) while adding some unique T9A stuff like 150 Magic allowance BSB to complement build options. The post was edited 2 times, last by tunasandwichify ( Dec 17th 2017, 8:05pm ). Must have been missing it but when the new books are out? It came out for Xmas !